Wasting more time will mean more division and conflict, which is what the armed forces warned of and of which it continues to warn. In the statement, the army gives the civilian leadership 48 hours to “fulfill the people’s demands” or else it will offer a political “roadmap”. Despite stating that the military “will not become involved in politics or administration”, the statement sure seems like a coup threat. The failures of Egypt’s transition from the Mubarak era to something different, whether democracy or whatever, have roots in areas I am not intellectually competent to address. It is certainly a deeper problem than bad institutional design and sequencing. However, Egypt is quite the textbook example of bad institutional design and sequencing. First a few reminders on the sequencing, then some thoughts on an institutional design that might be too late for Egypt, but potentially helpful in some future case of transition from dictatorship. In fact, a more moderate/liberal candidate finished a close third, and was thus eliminated. He might have been a Condorcet winner, meaning the candidate who would beat any other in one-on-one competition, but of course, he never got the opportunity to show if he was. There were other relatively liberal candidates in the race as well, which of course is the problem: they split the vote, whereas the Islamists (Morsi) and old-regime forces (runner up Ahmed Shafiq) were more unified. This leads me to my modest proposal. To guard against divisions in an unsettled political field during a transitional process, why not take a page from the old Uruguayan system of presidential election? In Uruguay, it used to be the case that the presidency was chosen by essentially an open-list PR system. A party or alliance could have several candidates, and the winner was the candidate with the most individual votes within the party/alliance with the most collective votes. I am not suggesting this system exactly: I think either a majority-opposed president or a candidate with the most personal votes who nonetheless loses (because he was not in the biggest party/alliance) is a potentially dangerous idea in cases of poorly defined political lines–such as Egypt currently. Rather, I am proposing such a system for the first round only. The eventual winner would still require a majority. Here is how it would work: candidates would have the option of declaring alliances with other candidates, once registration of contenders was complete. If one of the candidates won an absolute majority, the race would be over, and the alliance declarations would not come into play. However, in the event no candidate won a majority of votes, the runoff pairings would not necessarily be the top two candidates. Instead, they would be the leading candidates from each of the two largest alliances. Of course, there is no guarantee that candidates representing a potential bloc of moderate voters, such as Egypt’s liberals, would agree to set aside their egos or policy disagreements and declare an alliance. But such a rule would give them the option, and at least provide the more moderate forces a chance of avoiding a catastrophic coordination failure. Such failure is inherent in a first round that is more SNTV (multiple candidates from a bloc or proto-bloc, but only candidate votes matter in setting the top two) to one that is more open-list (pooling of allied candidates’ votes being the first criterion in setting the runoff pairing). One might argue that it would be better to use ranked-choice ballots, such as the alternative vote (a form of “instant” runoff). Or not to have a presidency at all. These might be good arguments. But actual transitional cases often have a presidency, and in practice never have ranked-choice ballots. I offer this modest proposal as a more palatable one–or so I think it could be–that addresses the basic problem. It is too late to save Egypt from a major political crisis, and it is in any case a lot to ask of a presidential-election method to save a country from crisis. But at least the rules chosen should stay out of the way, and the top-two majority-runoff rule did at least fail to do no harm. Is there any authoritarian regime that has such competitive executive elections as Iran’s? Has there ever been? Authoritarian regimes are not my specialty, but I suspect the answer to both questions just might be no (at least if by “ever” we exclude the liberal but pre-democratic regimes of the 19th century). While I do not claim to have insights into the Iranian leadership, the regular elections for that country’s president are striking in their featuring many less-than-dominant winners and, at least apparently, in frequently not having a pre-identified “official” candidate. These patterns are evident in the most recent election, in which Hassan Rouhani was elected president with barely over 50% of the vote. Usually in authoritarian regimes that hold elections, the winner gains an officially proclaimed large majority–more like 70%-90%–and there can be no mistaking well before election day which candidate is the one sanctioned by the current leadership. Iran seems to be the exception. Now we know from the 2009 experience that, when push comes to shove, the regime insiders have no compunction about ensuring their favored candidate is proclaimed the winner, and in suppressing opposition-led protests, filling up the jails and even the morgues if necessary to enforce their will. That is, after all, why it is an authoritarian regime, not a democracy. But it is an unusual breed of authoritarianism, 2009’s events notwithstanding. I often argue we can learn a lot about a country by just looking at its election results. Of course, I am usually referring to democracies. Can we do the same even when the country in question is not a democracy? This graph points out some potentially significant trends in the internal competition within Iran’s narrow, mostly conservative, revolutionary elite. Taking the official statistics at face value, ((With the possible–likely?–exception of 2009, I do not think this is too much of a stretch.)) 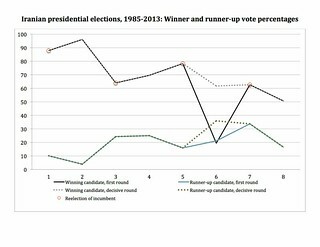 the graph shows the winning and runner-up candidates’ vote percentages in every election since 1985. ((I could not find 1981, when Ali Khamenei began his first term as president, two years after the revolution. It is possible that he was unopposed. Khamenei is now the Supreme Leader.)) It shows the first round and the decisive round; these are the same in every election but the sixth one, in 2005, which is the only time a runoff was required. Elections in which an incumbent was running (and elected–at least officially–to a second term, are circled in red. Mohammad Khatami, in 2001 (the fifth election) is the only incumbent to be credited with a substantial uptick in votes (from 69.6% to 78.3%), while Akbar Hashemi Rafsanjani has by far the biggest decline in a reelection bid (from 96.1% to 64%). Among the noteworthy things are the general downward trend in the winner’s share during this time, focusing here on the decisive round. Of course, the one election that looks especially aberrant is the one that produced the presidency of the now-outgoing incumbent, Mahmoud Ahmadinejad. That election saw a clear lack of coordination on the part of the elites, with five candidates obtaining from 13% to 21% of the votes, and the eventual winner having finished second in the first round (note how the “winning candidate, first round” line drops below that of the runner-up). Ahmadinejad, whose tenure would be marked by several conflicts with the Supreme Leader, was clearly an accidental president. The other thing that jumps out in the graph is that while the second candidate’s share has tended to trend upward over most of this sequence, it trended significantly downward in 2013. This of course shows the lack of coordination on a conservative alternative to Rouhani. In their article, Farhi and Loftian suggest that if the conservatives had managed to coordinate on a single candidate, they might have at least forced the race into a runoff. That may be so; while Rouhani did win (just) over 50%, it is possible that with a single dominant candidate for the more-conservative forces in the race, Rouhani might not have made it to 50%. Besides, we can certainly take the precise vote share with some grains of salt. Had there been a conservative push to coordinate on one candidate, it could have turned into a polarizing race. Had there been a runoff, there surely would have been a polarizing race–perhaps worse than 2009. It would not surprise me if some of Khamenei’s inner circle simply decided to assure Rouhani won the votes–whether cast by actual voters or by electoral alchemists–to push him over the 50% threshold and thereby prevent a runoff, given Rouhani’s broadly acceptable profile. Whether my specific interpretations are correct–I know next-to-nothing about Iranian clerical politics, after all!–the picture given by the graph is one of a declining ability of the revolutionary leadership to locate a single candidate who can unite the regime’s factions sufficiently to produce the large margins that are more typical of electoral authoritarian regimes. An authoritarian leader endorsed by barely half the electorate is unusual. When situated in the context of the other, quite different, electoral challenges indicated by the results of the 2005 and 2009 elections, Rouhani’s narrow clearance of the majority mark may signal a gradual unravelling of the revolutionary coalition. Of course, whether that results in eventual democratization or some sort of bigger crackdown, or rebellion, is impossible to say. Data are from Wikipedia, which in turn cites the Iranian Interior Ministry as its source. Malaysia goes to the polls on 5 May. The lower houses of the federation and 12 of the 13 states are up for grabs. There is no real question about whether Anwar Ibrahim, the opposition leader, will win, but there is a large question about whether that will show in the allocation of seats. Malaysia has an electoral gerrymander that would have drawn a blush to the cheeks of Joh Bjelke-Petersen, who ruled Queensland long after his party had ceased attracting anything like a majority of votes. At the 2008 national election, Anwar’s Pakatan Rakyat coalition won more than 50 per cent of the popular vote but took just 82 seats in the 222-seat parliament. The government held the rural seat of Putrajaya with just 6008 votes while the opposition needed 112,000 votes to take the urban seat of Kapar, in Selangor state. Analysis by Bersih, the Malaysian corruption and election watchdog, has found that the gerry-mander means it is feasible for the ruling coalition to achieve a simple majority in parliament with as little as 18.9 per cent of the popular vote. The really interesting things to watch will be the extent that Anwar’s predicted majority will be allowed to show in the results, and the extent to which the security forces will allow him to take office. I don’t pretend to understand how significant are the events today in Yemen. But if I had to hazard a guess, I’d say “quite”. Chilling story in the LA Times today.